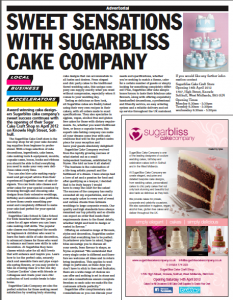 Award winning cake designers Sugarbliss cake company sweet success continues with the opening of their Sugar Cake Craft Shop at the beginning of April 2012 on Knowle High Street, Solihull. The SugarBliss Cake Craft store is the one-stop shop for all your cake decorating supplies from beginner to professional. With a huge selection of cake decorations, ingredients, cake bases, cake making tools & equipment, moulds, cupcake cases, boxes, books and ribbons you should be able to find everything you need to make your very own delicious cakes every time. You can also hire cake making equipment and get expert advice from their experienced Sugarbliss team of cake designers. You can book cake classes and order cakes for your special occasion by browsing through and choosing cake designs from their extensive weddings, birthday and celebration cake portfolios, or have them create something personal and completely different to make your cake just perfect for your special celebration. Sugarbliss Cake School & Cake School For Kids launched earlier this year, caters for all ages where you can learn cake making craft skills. The popular cake classes run throughout the month for beginners & children who want to learn the basic skills of cake decoration, to advanced classes for those who want to enhance and learn new skills in cake decoration. At Sugarbliss they have classes which cater for all skill levels that will enhance and inspire you. Learn how to ice the perfect cake, securely stack and assemble tiers and pipe exquisite spring flowers, or you may prefer to take an evening class or a fun one day ‘Couture Cookies’ class with friends or colleagues and create their own chic collection of iced cookie treats to take home. Sugarbliss Cake Company are also the perfect solution for those seeking sweet satisfaction by creating truly stunning cake designs that can accommodate to all tastes and desires. From elegant and chic party cakes to the traditional tiered wedding cake, this unique company can supply exactly what you want without compromise, especially when it comes to your wedding day. Tasting as delicious as they look, all Sugarbliss cakes are freshly baked using their very own recipes in their cakery, with all orders made to exact specifications. They also specialise in eggless, vegan, alcohol free and gluten free cakes for those with dietary requirements. So, whether you want traditional tiers, or fancy a cupcake tower, this superb cake baking company can make all your desires come true with cake creations that will be the perfect centre piece for your reception and leaving your guests absolutely delighted! Sugarbliss offer complimentary cake consultations, so you can discuss your needs and specifications, whether you’re seeking to match a theme, cater for a certain number of guests or simply looking for something completely different! Plus, Sugarbliss offer cake sample boxes for you to taste their fabulous cake flavours, along with offering exquisitely handcrafted decorations, a professional and friendly service, an easy ordering system and a reliable delivery and set up service throughout the UK mainland. 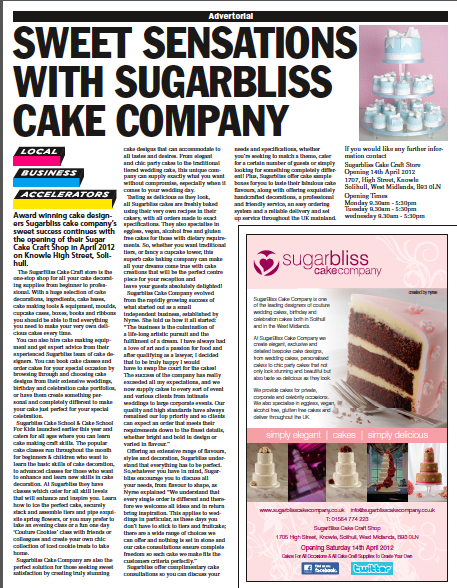 If you would like any further information contact Sugarbliss Cake Craft Store, Opening 14th April 2012. Opening Times:- Monday 9.30am – 5pm, Tuesday 9.30am – 6pm, Wednesday 9.30am – 6pm, Thursday 9.30am- 8pm, Friday 9am- 6pm, Saturday 9am- 5pm. This entry was posted in Cake Craft Shop and tagged Cake Craft Shop by Sugarbliss. Bookmark the permalink.